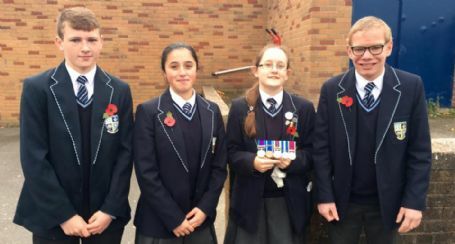 SAVIO SALESIAN COLLEGE REMEMBERS THE WAR. The whole college respectfully commemorated those who sacrificed their lives in the wars of the 20th century during today's Service of Remembrance. Mr. King read out the names of those who have died, from Bootle, in the First World War. Students laid crosses with the soldier's names as a mark of respect. Antonia proudly displayed her Dad's medals from his service in the Armed Forces. Head Girl Aleisha and Head Boy Ben lead on today's Service of Remembrance with Fr. Jakub.